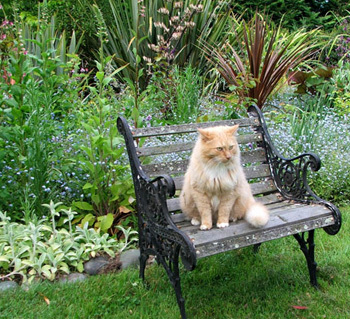 Good gardens always have lots of seats, don't they? Gardeners have to remind themselves to stop, sit, and enjoy. And for a more mature gardener, a gently curving garden bench is far superior to stretching out on the grass. It's certainly easier to get back up on the gardening feet again! There are lots of seats in the Moosey Garden, mainly humble, homemade, or recycled - repaired park benches, railway sleepers on bricks, large tree stumps and the like. My garden seats are meant to be sat on. Rustic seats that offer only splinters and the stress of imminent collapse are not welcome here, though I can't answer for any natural weathering processes! Sometimes I'll just flop on a seat and catch my breath. Other times I'll approach well organised, with suitable cushions, a book, and refreshments - hopefully one of my cats will join me. I've had some great cat-conversations while sitting on one of my garden seats. Aargh! My new white wire seat is in the wrong garden spot. As I see it (from my cosy bed at dawn, doing a huge sweeping overview of the whole garden) it's a contest, with the incumbent (Duck Lawn) and three strong and worthy contenders. The Moosey indoor-outdoor flow comprises a decking and two paved patios - a lower and an upper. Obviously one tends to sit where the chairs and tables are, so until recently the upper patio has been used for drying clothes and little else. Ha! That's all changed! I've placed two 'chunky persons' garden seats either side of the Glass-House path. Note that I am not necessarily encouraging supersized garden visitors. But who wants to be squashed into a garden seat and instantly reminded of being on a long distance aeroplane? The patio table and chairs were expertly made by Non-Gardening Partner a few years ago. I was oh so very proud. These would be the first of many pieces of amazing home-made garden furniture. I would be the envy of all my country gardening friends! I tried this wooden garden bench in quite a few garden spots before settling it in the Hen-House Garden by the water. This, finally, is the perfect spot - secluded and mysterious, difficult for even the cats to find me. Two sturdy wooden garden benches, lovingly home-made from recycled timber, mark my first serious flirtation with rustic garden furniture. After all these years of resisting, I've finally succumbed to the romance of the rustic. Something old, something new, something borrowed something blue... Except my new garden chairs were gifted from a friend, and they arrived in a most dreadful state, with peeling white paint. For some reason, garden seats and benches are one of the most hotly searched-for items of garden paraphernalia. Real-life garden visitors remember more about the seating than the planting style, and virtual gardeners are obsessed with viewing pictures of garden chairs. The Oak Tree seat was erected in 2001, a piece of an old railway sleeper balanced on columns of old bricks. It was first situated near some big Oak trees, just where the path dipped down to the water's edge. The garden bench at the top of the Wattle Woods has a real woodland feel to it. Huge Wattle tree branches spread overhead, chunky Camellias grow behind, and the water race is close by. It's a festival of foliage all year round. This garden bench was the very first garden seat that I purchased. It started life as a summer lunch spot, under newly planted oaks and original Tagaste trees (tree lucernes) in the Pond Paddock.